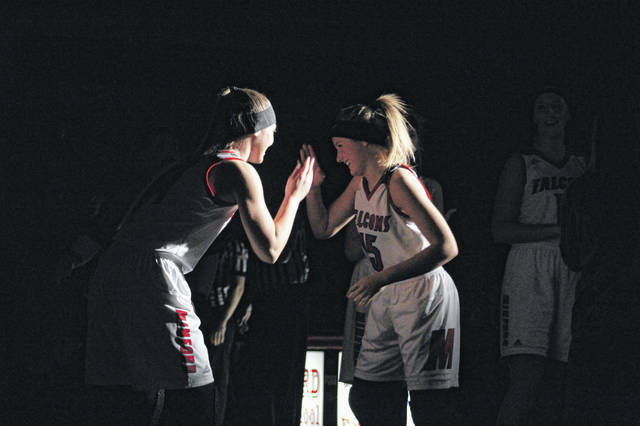 Minford’s Livi Shonkwiler (right) greets teammate Brittany Wolfenbarker during player introductions before a game earlier this season. New Boston’s Tyler Caldwell set a single-game school record with 10 3-point field goals while scoring his 1,000th career point Friday night. PORTSMOUTH — Another week down, another week closer to tournament season … which is, personally, my favorite part of the high school sports calendar. A. Minford’s girls lost twice this week but let’s not overreact or be quick to underestimate the Falcons’ ceiling. Two losses, a home date with Miami Trace (54-45) and a road contest at Oak Hill (46-44), doesn’t define a season, nor will it define this team. Coach Shane Davis’ crew is plump full of scoring options including Ashley Blankenship, Livi Shonkwiler, Caitlyn Puckett, Maddie Slusher and Hannah Tolle .. and that’s just the starting five, Davis has Makenzie Watters and Brittany Wolfenbarker coming off the bench. The Falcons will be just fine. Write that down. B. Seemingly under the radar, Notre Dame’s girls are now 14-0 after beating Division I Huntington (W. Va.) Saturday afternoon. I can’t put enough emphasis on how good these Titans really are on the defensive side of the ball. With Katie Dettwiller inside and a stable of quick, capable guards including Ava Hassel, Isabel Cassidy and Clara Hash on the perimeter, ND can hang with anybody … and we’re just discussing defense. The offense has spoken for itself. C. West’s boys have been quite the case of Jekyll and Hyde this season. The Senators, who are 6-6 overall, beat Northwest last week before getting knocked off by Minford, 66-63, this week. The talent is there, especially with Dylan Bradford and Jesse Johnson. When those two get hot at the same time, West can produce a scary matchup. But it depends on which version of the team shows up on a nightly basis. It’ll be interesting to see how the Senators develop down the stretch. So … New Boston’s Tyler Caldwell came to play this week. On Tuesday, the senior had 17 points and seven assists in an 83-62 win over Ironton St. Joe. 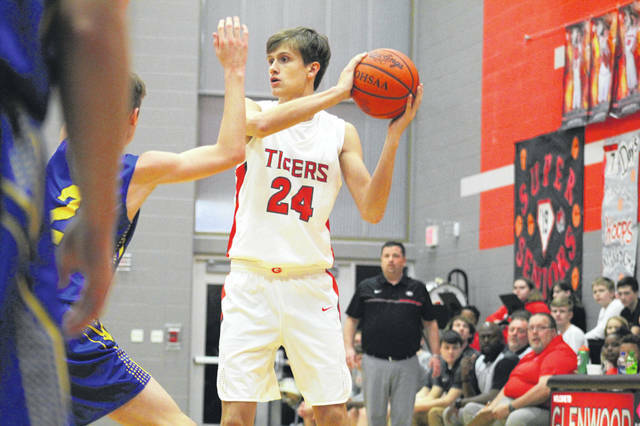 He followed that up with a 41-point performance in Friday’s 106-57 win over East — a victory where he set a new single-game school record with 10 3-point field goals while scoring his 1,000th career point. Notre Dame’s Ben Mader and Jackson Clark both scored 24 points Friday in the Titans’ first win this season, a 59-56 decision over Clay. Mader and Clark have been overlooked this season due to their team’s record but both are quality players and more importantly, quality kids. Wheelersburg’s Abbie Kallner and Kaylee Darnell were, well, their regular selves this week. Kallner scored 22 in Monday’s 53-46 win over Ironton while Darnell added 16. That was after Kallner had 17, followed by Darnell’s 15 in Thursday’s 56-41 win over Northwest. Today’s flush brought to you courtesy of South Webster’s Shiloah Blevins. Back in conference play Thursday, Wheelersburg’s girls travel to Waverly to face a Tigers team that looks to be clicking on all cylinders … Waverly has won four in a row and six of seven. That same night, Green goes to New Boston in what should be an entertaining contest. Saturday, Minford hosts Division II Washington Court House in what’s slated to be a slugfest. On the boys side, Coal Grove visits Portsmouth on Tuesday as the Trojans try and bounce back from a rough stretch as of late while Valley travels to North Adams Saturday evening in non-league action.